What Is Swimmer's Ear (Otitis Externa)? Can You Swim with Swimmer's Ear? Which Types of Doctors Treat Swimmer's Ear? When Should I See a Doctor for Swimmer's Ear? What Home Remedies Treat Ear Pain and Other Symptoms? What OTC Medications Help Ear Pain? What Prescription Medicine Helps Swimmer's Ear Pain? How Long Does It Take to Treat Swimmer's Ear? The definition of swimmer's ear is an infection, inflammation, or pain in the ear caused by water trapped in the ear canal. This condition frequently occurs in swimmers, which is why it's known as swimmer's ear but it can occur in anyone, even from showering. The main cause of swimmer's ear is a break in the skin lining of the outer ear or ear canal that allows bacteria or fungi to invade the outer ear. A break in the skin may be caused by scratching the ear area, skin conditions such as seborrheic dermatitis and psoriasis, improperly cleaning your ears with cotton-tipped swabs or other objects inserted in the ear, using devices inserted into the ear (earplugs, hearing aids, headphones, earbuds, and other devices), or chemicals (hair dyes, bleaches, certain shampoos, hair sprays). Swimmer's ear is diagnosed with a history and physical examination of the inside of the ear. Any drainage may be examined under a microscope to determine the type of infection. Home remedies to treat and cure swimmer's ear include avoiding water exposure (including avoiding swimming), applying heat to the affected ear to control pain, and over-the-counter (OTC) pain relievers. Medical treatment for swimmer's ear includes medications prescribed for symptom relief, cleaning the affected ear, antibiotics, topical ear remedies, or acidifying, antiseptic, or anti-inflammatory agents. The prognosis for swimmer's ear is good. Pain from swimmer's ear usually goes away within 24 hours after medical treatment begins, and the infection typically clears up within a week. Swimmer's ear (also called otitis externa) is a painful condition of the visible or outer portion of the ear and ear canal (outer ear). The ear canal is a cylinder-shaped structure that extends from the outer part of the ear, above the earlobe, all the way to the eardrum (tympanic membrane). The typical size of the canal is about 2.5 centimeters in length and 7-9 millimeters in width. The main function of the ear canal is to protect the middle ear from infection and entry of foreign objects. This function is accomplished by the length of the canal, making it difficult for objects to enter. In addition, the outer portion of the canal produces ear wax (cerumen) that helps trap debris entering the ear. It also produces an acidic environment that may be harmful to bacteria entering the ear. There is also hair in the ear canal which provides an additional barrier against debris entering the ear. 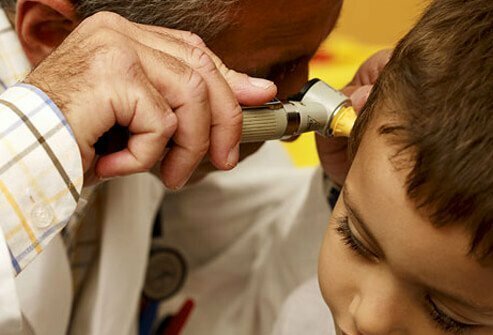 Males and females of all ages are affected by otitis externa equally, but children and teenagers most frequently develop this type of ear infection. It is estimated that swimmer's ear is responsible for 2.4 million doctor visits in the U.S. Children are most often affected as they routinely spend more time in the water swimming, etc. during vacation periods than adults. However, competitive swimmers and adults that are frequent swimmers are disproportionally affected as well. The most common symptom of swimmer's ear is ear pain or an earache. The pain gradually begins over a day or two. The ear pain almost always involves only one ear. The pain is especially intense when the ear is touched or pulled, or when chewing. The ear canal may itch. The outer ear may be red. In severe cases, the ear canal may be swollen shut. The ear may drain fluid or pus. This drainage may be clear, white, yellow, or sometimes bloody and foul smelling. Some fluid may crust at the opening of the ear canal. With severe swelling or drainage, the person may have trouble hearing. Ringing in the ear (tinnitus) and dizziness or spinning sensation (vertigo) may also be present. Fever is generally not present. If there is a fever, it is not usually high. In severe cases, pain that extends to the side of the face or neck. Swollen lymph nodes if the infection is present. The skin lining the ear canal and outer ear serve as a barrier against infection from bacteria and fungi. The ear is protected against infection because the lining is slightly acidic. The lining is also a physical barrier that protects against excessive moisture. Any break in the skin lining can lead to infection, allowing bacteria or fungi to invade the outer ear. When you attempt to clean your ears with cotton-tipped swabs or other objects inserted in the ear, the skin lining of the ear canal may break. This can also remove the protective ear wax from the ear canal. The break in the skin allows an infection to start. Excessive moisture in the ear canal from showering or swimming alters the acidic environment of the ear canal and allows for the invasion of bacteria or fungi. This is the reason this condition happens mainly in the summer months and is called swimmer's ear. This is especially important when exchanging earbuds with other people. If a person has an ear infection it can be transmitted through earbuds. Ear plugs, hearing aids, headphones, and other devices that may be inserted into the ear canal may increase the risk of swimmer's ear. Chemicals such as hair dyes, bleaches, and shampoos may irritate the ear canal and alter its protective properties. An infection can result. Skin conditions, such as seborrheic dermatitis and psoriasis can cause cracks in the skin that allow bacteria or fungus to enter. Generally, any inflammation of the outer ear canal, such as infections, allergies, or skin conditions, can lead to swimmer's ear. The most common bacteria responsible for outer ear infection are Staphylococcus aureus and Pseudomonas aeruginosa. Other bacteria are less common. In less than 10% of cases fungus causes of swimmer's ear. You should not swim if you have swimmer's ear. Even if you wear earplugs, they do not have a tight enough seal to completely keep water out, and your ears need to stay dry to heal. Scuba diving and other water activities also should be avoided. A family practitioner, internist, or pediatrician may initially diagnose and treat swimmer's ear. In an emergency department, you would see an emergency medicine specialist. If the condition is severe patients may be referred to an otolaryngologist (an ear, nose, and throat specialist, also called an ENT) to treat swimmer's ear. Pain is not controlled with over-the-counter medicines that are taken as recommended on the label. Any pressure on the outer ear may cause great pain, so it is often difficult to lie down with the affected side against a pillow. Many people with swimmer's ear have trouble sleeping until they get medical attention. The person has any signs of facial weakness or double vision. The person has diabetes or some other condition that prevents the immune system from functioning normally. If there is associated redness or swelling that extends down the neck or along the face from the ear, immediate medical attention should be sought. If the swimmer's ear does not improve after one week of medical treatment. The symptoms of swimmer's ear worsen. Swimmer's ear, in general, is not an emergency. However, a person should go to an emergency department at the hospital if they are experiencing symptoms of swimmer's ear and have diabetes, a compromised immune system, are running a fever, are experiencing dizziness or facial weakness, or have a history of prior ear surgery. The doctor can easily make a diagnosis of swimmer's ear after taking a brief history and performing a limited physical examination. Pain produced by gently pulling on the ear as the doctor attempts to examine the ear canal is a likely sign of swimmer's ear. The doctor may look at the ear canal with a lighted scope called an otoscope. With this, if swimmer's ear is present the doctor can see if the ear canal is swollen, red, or sometimes coated with a whitish material called an exudate. The doctor may examine the drainage from the ear under a microscope to determine if bacteria or fungi are causing the infection. This allows the doctor to prescribe either an antibacterial or an antifungal medicine. X-rays and blood tests are rarely needed. Treatment for swimmer's ear includes home remedies such as avoiding water exposure (such as swimming), applying heat to the affected ear to control pain, and over-the-counter (OTC) pain relievers such as aspirin, ibuprofen, or acetaminophen. Medical treatment for swimmer's ear include medications prescribed for symptom relief; cleaning the affected ear; and at times, antibiotics, topical ear remedies, or acidifying, antiseptic, or anti-inflammatory agents. Home care for swimmer's ear can be used to control pain temporarily. However, because OTC ear drops are not strong enough to cure the infection, a visit to a health-care professional for specific medications is needed. Swimmer's ear is usually not an emergency situation in most cases, so call your doctor for an appointment and use a home remedy to relieve symptoms in the meantime. Avoid any further trauma to the ear. Do not attempt to remove visible debris or drainage from the ear. Stop swimming or exposure to water until the condition improves. Apply heat to the ear to control the pain at home. The warmth from a heating pad may provide some relief. Fold a towel in half and place it between the heating pad and the ear. Limit the use of the heating pad to short periods. The folded towel should help prevent accidental burning of the ear if the heating pad is too hot. A white vinegar rinse may be used in mild cases of swimmer's ear to help restore the ear canal's natural pH and reduce swelling. Dilute white vinegar with equal parts water or rubbing alcohol. Do not use undiluted vinegar as it is too acidic and could cause further irritation. Lie down with the affected ear upward and fill the ear canal (ideally, someone else will do this for you). Leave the solution of vinegar diluted with water or alcohol in for 5 minutes, then turn your head to the side and move the ear to drain the solution. Note: Do NOT do this if there is a hole in the eardrum or if you have ear tubes that have been inserted. The American Academy of Otolaryngology does not recommend the use of ear candles as a home remedy for swimmer's ear, as they may cause more injury to the ear. OTC pain medicines such as aspirin, ibuprofen (such as Advil), or acetaminophen (such as Tylenol) may be used for pain relief of swimmer's ear. Nonprescription ear drops are not usually strong enough treatment to cure swimmer's ear. Such drops are useful only for prevention of episodes after water exposure. Ear drops used for treatment swimmer's ear must be obtained with a prescription from a doctor. Do not try and treat the ear infection with drops purchased over-the-counter. This can make the affected ear worse and prolong recovery. Consult your health-care professional before using any ear drops for swimmer's ear. If there is a large amount of drainage or debris in the ear, the doctor will clean out the ear canal before medicine is placed in the ear. The ear canal may be cleaned out using a wire or plastic loop instrument or under direct vision using a suction device. After cleaning the ear, the doctor may place a foam wick in the canal. This allows antibiotic or antifungal ear drops or both to be placed onto the wick. The wick swells up inside the ear canal, thus holding the medicine in place against the lining of the skin. Oral pain medicines may be prescribed if OTC medicines are not strong enough. Oral antibiotics are not often prescribed unless the infection is severe (complicated otitis externa including extension of the infection to the adjacent skin). Topical remedies or swimmer's eardrops are generally directed toward treatment of inflammation and infection. Acidifying agents are effective because the common bacteria responsible for outer ear infection cannot survive in a very acidic environment. Examples include acetic acid (vinegar), hydrochloric acid, salicylic acid, boric acid, sulfuric acid, and citric acid solutions. Antiseptic agents work by potentially killing the offending bacteria. Some of these antiseptic solutions are alcohol, gentian violet, m-cresyl acetate, thimerosal, and thymol. Most of these are typically applied into the ear canal by an ear specialist (otolaryngologist). Anti-inflammatory agents help with inflammation and may reduce pain. Some studies have shown the combination of anti-inflammatory and acidifying agents was superior to acidifying agents alone in reducing the duration of symptoms and providing pain relief for swimmer's ear. Anti-inflammatory steroids such as hydrocortisone (Acetasol HC, Vosol HC) or dexamethasone/ciprofloxacin (Ciprodex) are usually found in products in combination with antibiotics, acidifying agents, and antiseptics. Many topical antibiotics are available for treatment of swimmer's ear (otitis externa). These are usually found in combination with the other three groups of medications to increase the effectiveness of treatment. Oral or intravenous antibiotics are generally not used in the treatment of uncomplicated (simple) swimmer's ear. However, they may be appropriate in cases of severe infection in people with diabetes or those with weakened immune systems. They may also be used if applying topical eardrops is not possible due to severe swelling and closure of the ear canal. In cases of complicated otitis externa (redness and swelling extending down the neck and face), oral antibiotics can be helpful. Less commonly, an outer ear infection may be related to a fungal infection (otomycosis). Typically, this condition is suspected in people who do not respond to the usual treatment for swimmer's ear, those in tropical climates, or in people with multiple previous infections. Fungal infection can also cause more itching and less pain than bacterial infections. The examination of the ear may reveal a white, mold-like appearance. The treatment of fungal outer ear canal infection also focuses on the combination of topical antiseptics, acidifying agents, anti-inflammatory agents, and anti-fungal medicines. Clotrimazole (Lotrimin, Mycelex) and miconazole (M-Zole, Micatin, Lotrimin) are the most commonly used anti-fungal medications used to treat fungal ear infections. Eardrops are usually placed into the ear canal two to three times a day. It is helpful to have a second person put the ear drops in while the patient lies on their side with the affected ear facing up. The person should lie on the opposite side of the head when the drops are placed to allow the drops to soak in the ear, and not run out of the ear canal (if the patient prematurely stands up). Swimmer's ear clears up within a week for most people. Pain generally goes away within 24 hours if appropriate therapy is used. Failure to promptly reduce pain and swelling is often caused by excess debris in the canal that needs to be removed by the doctor. People with diabetes or those whose immune systems are weakened can develop a more worrisome form of the disorder that might require hospitalization for intensive medical treatment. This is referred to as malignant otitis externa and is not related to swimmer's ear, per se. If a person is concerned about malignant otitis externa, an evaluation by a health-care professional or an emergency department is imperative as this can be a serious condition. Although the two entities sound the same, they are distinctly different, and also are managed differently. In most cases, no additional care or visits to the doctor are necessary once the medication has been prescribed, and the doctor's instructions are followed. If pain increases and swelling or drainage do not decrease within 48 hours, a doctor should be contacted for a follow-up appointment. When a foam wick is placed, it is important to follow-up with a doctor to ensure it is properly and completely removed. Avoid further trauma or the chance of getting moisture in the ear for a couple of weeks after an infection. Swimming, scuba diving, and flying should be restricted until all pain and swelling are gone and no debris remains in the ear canal. Severe, recurrent, or difficult to treat swimmer's ear may be referred to an ear specialist (otolaryngologist). People who have had ear surgery such as tympanic membrane (eardrum) surgery and mastoidectomy (removal of part of the bone behind the ear or removal of the air spaces in that bone) should discuss water sports and ear protection with their ear specialist. People with tubes in their ears (a common technique used to prevent ear infections in smaller children) may also talk with their ear specialist about the best ways to swim and protect their ears at the same time. Use of shower caps while bathing and earplugs while swimming will help keep water out of the ear canal. The best earplugs are often soft balls of special wax. The wax can be purchased at most pharmacies. Simply roll a small ball of wax in your hands and press it into the outer ear. Many individuals make their own earplugs by placing a cotton ball coated with Vaseline in the ear. Homemade eardrops also help prevent swimmer's ear after water exposure. Make a 50:50 mixture of white vinegar and rubbing alcohol for use after swimming or exposure to water. Apply 3-4 drops in each ear canal after swimming. This helps dry the canal and maintain the acidic environment of the ear canal. Do not use cotton swabs to remove earwax from the ears. More often than not, this ends up pushing wax father into the ear canal and making problems worse. Dry ears thoroughly after swimming or showering with a fresh, dry towel. Waitzman, A. A., MD. "Otitis Externa." Medscape. Updated: May 04, 2017. What symptoms and signs did you experience with swimmer's ear? What was the cause of your swimmer's ear? What home remedies have been effective for your swimmer's ear? Please share your experience with swimmer's ear including home remedies and OTC drugs for soothing swimmer's ear pain and other symptoms.